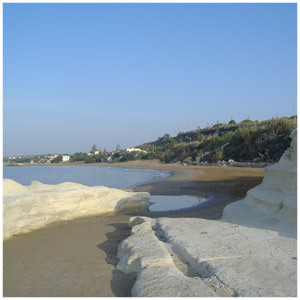 "THE KING'S REEF" campsite is on the sea coastline, 2,30 km from Pozzallo, a sea village in the province of Ragusa awarded with the "Blue Flag" for several years, and 300 m from Santa Maria del Focallo, a renown locality of Ispica (a neighboring town rich of monuments, churches and buildings in the liberty and baroque architecture. The campsite covers an area about 12,000 m² surrounded by olive trees, pines and eucalyptuses which assure a pleasurable shade for all our guests during the hot, sunny days. Equipped on open area with dish and clothes washing basins, foot washing or rinsing basins, hot-cold showers (solar heated & gas), flush toilets and sinks; also, there's a unit for disabled guests. A wide space is used for parking inside the structure. The bungalows are of new construction but refinished with a rural look, in complete harmony with the surrounding green, and equipped with personal flush toilets and shower, double bed (with the possibility for an extra single bed or bunk), color TV, sink, cooking area and air conditioner to make your stay more comfortable. The access to the beach is provided by an underpass which takes you right on a kilometric beach of golden sand, with characteristic dunes and rocks, surrounded by a large forest area. In a couple of hundred meters you can find, right on the beach, chalet and lidos where you can spend your time in company. And last but not least, for the daredevil ones, wind-surfing and kite-surfing is available with 2 corridors of throwing which will fly you right on top of these beautiful waters.